As a young fan of history in 1970s and 80s, my bookshelves were brimming with illustrated history books. Classics Illustrated comics, David Macaulay’s books and Dover history coloring books were all favorites. In my teen and college years of comic book fandom, I was introduced to the Pulitzer Prize-winning Holocaust graphic novel Maus by Art Spiegelman. Decades later, I loaded up my own boys’ shelves with beautiful books from Dorling Kindersley on such subjects as ancient history, the American Civil War and World War II. Now, as the kids have grown, they’ve made their own reading discoveries and turned me on to newer series. 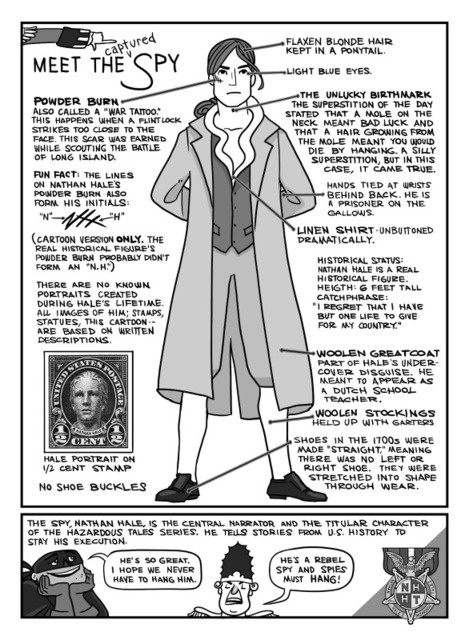 One of my current favorites is Nathan Hale’s Hazardous Tales. Nathan Hale is the actual name of the Utah-based author and artist of a variety of best-selling children’s graphic novels. His Hazardous Tales series focuses on US history with a wit and flair aimed at engaging kids in wonderful little vignettes of the past. His war-themed books include looks at the American War of Independence (One Dead Spy (2012)) the American Civil War (Big Bad Ironclad! (2012)) and World War I (Treaties, Trenches, Mud and Blood (2014)). He’s also taken on non-war subjects with the doomed Western settlers of the Donner Dinner Party (2013) and the story of abolitionist Harriet Tubman in The Underground Abductor (2015). Hale’s three war books introduce children to three different conflicts from three centuries of the American story. One Dead Spy outlines the American Revolution through the lens of famed Colonial spy Nathan Hale, his exploits, capture and martyred execution in September 1776. The first half of the book moves from Hale’s years at Yale to the Boston Massacre, the Boston Tea Party, the Battle of Bunker Hill, the capture of Fort Ticonderoga and the Siege of Boston. In the second half, the story shifts to the war in and around New York City and Long Island, making it of particular interest for my sons living amid the ground covered by the Battle of Brooklyn. Other historical characters including George Washington (naturally), Ethan Allen, Benedict Arnold and the colorfully-written Henry Knox all make cameos, each adding to the overall narrative which ends with Hale’s hanging just as the war was gearing up into its later years and eventual victory for the American colonists. 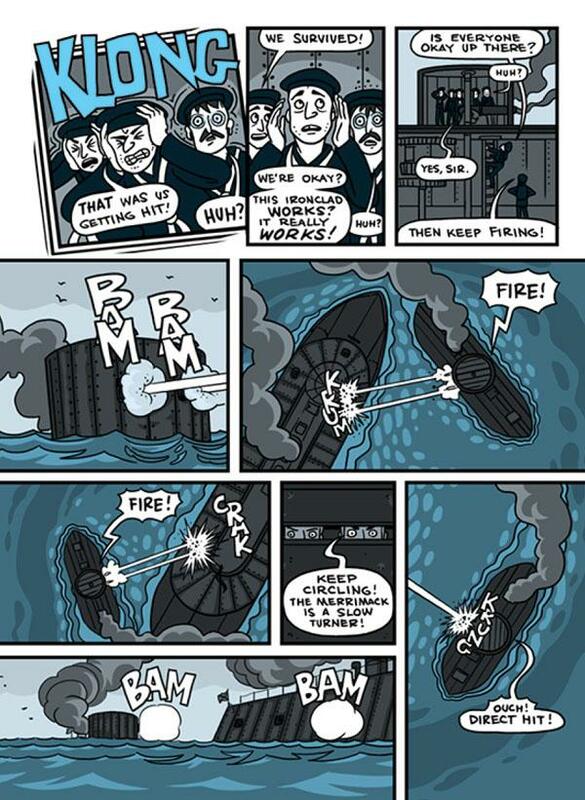 The American Civil War gets its treatment in Big Bad Ironclad which tells the story of the nation-defining conflict through the epic development and battle of the first US ironclad ships in March 1862. With so many stories to be told from the Civil War, this book’s focus on the relatively ignored naval side of the conflict makes for another interesting tale. A colorful cast of well-known and marginal characters, including Abraham Lincoln, Secretary of the Navy Gideon Welles, Swedish immigrant inventor John Ericcsson and US naval hero William Cushing, frame the story. Drawn in blues, grays and blacks, the historic figures and events helps to place this sideshow to the American Civil War as a not-to-be-forgotten part of American history. My favorite of Hale’s three war books is Treaties, Trenches, Mud and Blood which does an amazing job of explaining the complex causes and series of alliances which contributed to the outbreak of the Great War in August 1914. The story begins in the obvious place with assassination of Archduke Franz Ferdinand of Austria by the somewhat hapless Gavrilo Princip in Sarajevo in June 1914. After the entertaining opening act, the book moves to outline the intricacies of the allied European nations. 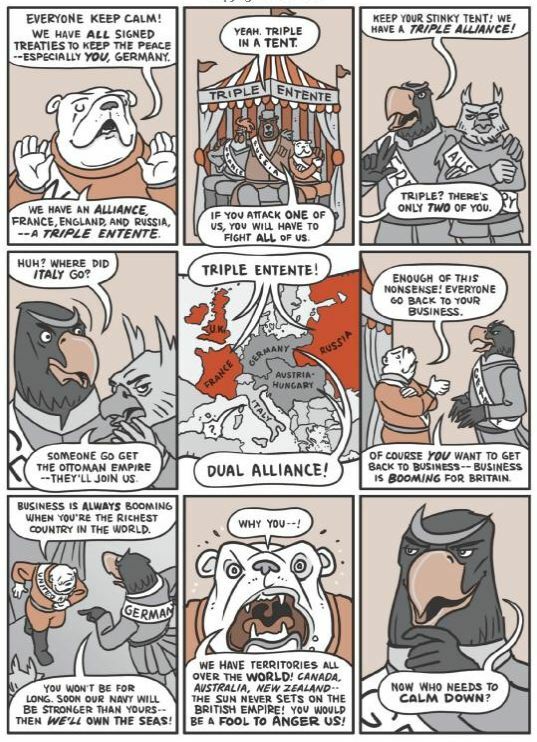 Using the cartoon and comic book convention of animals as characters, each country is cast as a different creature — UK (bulldog), Russia (bear), France (rooster), Austria-Hungary (owl), Germany (eagle). You might think explaining geopolitical politics would be a yawn in a children’s book, but Hale carries it off such that even adults would benefit from the World war II overview. The story marches onward to 1914, erupting in the war depicted in a dramatic double-page spread of assembly line of manpower grinding to battle with the Greek god of war Ares overseeing the entire coming slaughter. Weapons, the introduction of tanks and trench warfare all get their due in the second half of the book, but it’s the pre-war framing of European empires in conflict which makes this book a standout intro to the war for all ages. 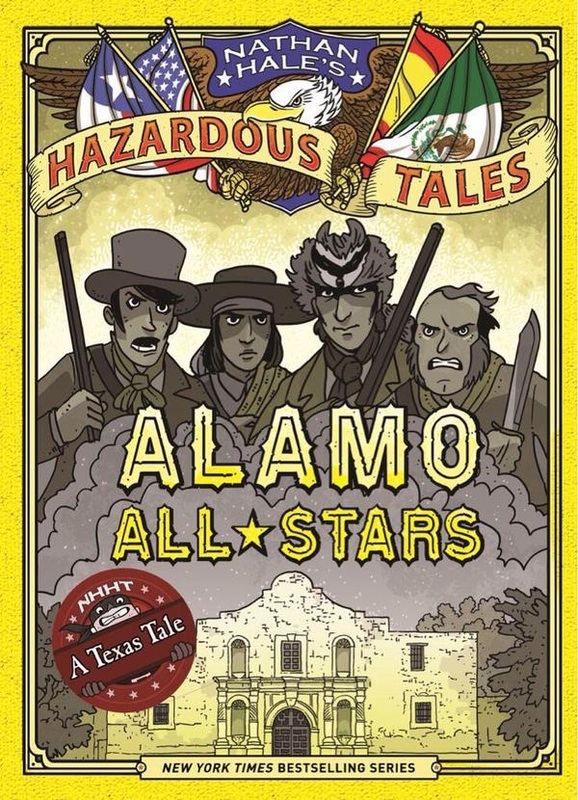 The upcoming sixth book in the series, Alamo All Stars, will appeal to Texans and Texans at heart with the tale of the heroic defense of the Alamo in 1836. With the school year just under way, all of Hale’s Hazardous Tales are worthy of reading lists, no matter the age. Each book also contains a bibliography and more factual information at the back of the book, making all these books a great jumping-off place for budding historians and maybe some future wargamers, too.